The Mister Rabbit candle: Fairy tale-esque. 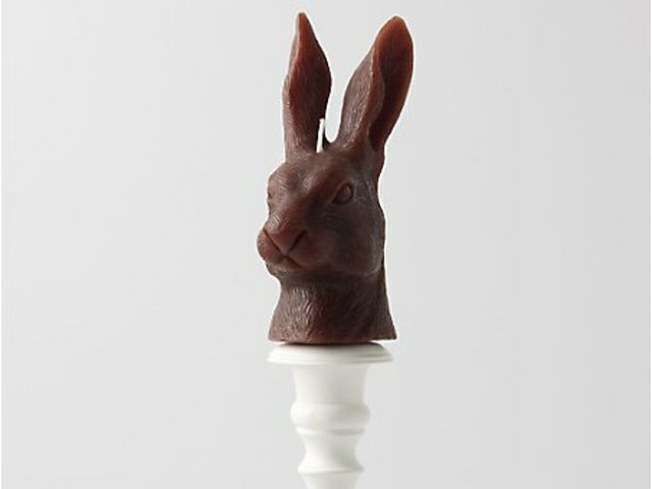 ANIMAL HEAT: Loving this yuletideish Mister Rabbit candle, a delicate, detailed chocolate-colored wax bust set atop a classically-shaped resin candlestick, the whole thing regally sitting more than a foot high. Fairy tale-esque. $34 at Anthropologie; find locations here. WAX ON: Get 25% off Barbour outerwear when you donate a castoff as part of their holiday coat drive to benefit less fortunate New Yorkers, running through December 26. Not that you need an incentive to add one of their iconic jackets, like the wax-coated cotton classic, to your wardrobe. 1047 Madison Avenue; 212-570-2600. GOOD HAIR MONTH: How’s your mop looking? You have until November 30 to shop the Ricky's NYC sale, where you can shave 20% off all pro haircare products and gizmos, and off the entire Mattese Elite makeup label as well. Find locations here.